Intercultural Communication research papers examine the aspects of interpersonal communications in business and in dealing with the global economy. Intercultural communications research papers illustrate that there are several approaches to intercultural communication. Have the writers at Paper Masters explain intercultural communication in a custom research paper that is written just as you need it to be. The first necessity is an understanding of what intercultural communication really is. Improvements in transportation technology, developments in communication technology, globalization of the economy, and changes in immigration patterns necessitates a need for communication from one culture to another. This goes beyond human communication. 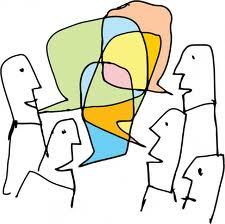 It develops into a deeper form of communication, which is referred to as intercultural communication. There are three categories of culture; artifacts, concepts, and behaviors. Combining the elements of both precipitates the whole of intercultural communication. An understanding of diversity stems from an understanding of international cultures. The cultures between the East and West offer a great amount of diversity. An Eastern practice for communication is found in the teachings of Confucianism. The main elements of this thinking are process orientation, differentiated linguistic codes, indirect communication emphasis, and receiver centered. Other Eastern philosophies include Hinduism, Arab culture, and Greek perceptions on interpersonal communication. All of these cultures differ widely in their means of cultural communication. Thus and understanding of Eastern cultures aids greatly in intercultural communication. Cultures beyond the borders of the United States are presumed by most everyone but co-cultures that exist within our country’s borders are taken for granted within our Euro-American culture. The United States is and continues to grow as a multicultural society. Issues related to such a society that need consideration are negative stereotyping, acceptance, personal expressiveness, authenticity, understanding, goal attainment, and power dynamics. This extends from various international cultures to differences in gender and sexual preference. Organizational Communication - The fundamental purpose of Organizational Communication is to enable and energize employees to carry out the organizations strategic intent. Communications - Communication theory reflects a desire by theorists to develop a mathematical model that imitates and predicts language’s ability to communicate information through communication skills. Active Listening - Research papers on active listening examine the communication technique often employed by professionals in the counseling or conflict resolution fields. Language and Globalism - Globalism trends exert tremendous influence upon language acquisition and use. Paper Masters writes custom research papers on Intercultural Communication and examine the aspects of interpersonal communications in business and in dealing with the global economy.